In 1910, Keir Hardie, Scottish leader of the Independent Labour Party (established in 1893) urged a general strike, and especially strikes in the arms and transport industries, should war be declared. When war broke out the Independent Labour Party (ILP) refused to vote in favour of war credits, unlike many of their Parliamentary Labour counterparts. Some of the leading campaigners against arms trade profiteering, such as Helen Crawfurd, James Maxton and Philip Snowden, were ILP members. In the second week of war, the ILP published a long resolution unequivocally condemning the belligerent government. It expressed friendship and compassion to workers of all nations: ‘GERMAN WORKERS OUR COMRADES.’ Yet there was no call for protest strikes in the early days of war, despite Hardie’s 1910 resolution. The ILP’s strongholds were Scotland, which tripled its membership during the war, and the North of England. There were tensions between the Party north and south of the river Tweed. 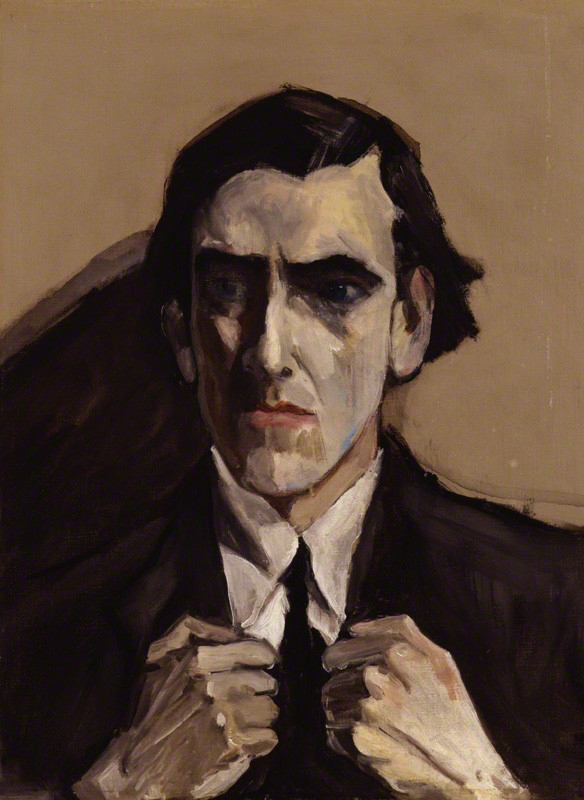 Fenner Brockway, the editor of the second ILP newspaper, Labour Leader, visited Scotland and summed up the differences thus: ‘They were speaking a different language from the English ILP-ers. Whilst we were exposing the duplicity of the foreign policy, which had led to the war and advocating a peace of no conquests and no indemnities, they were denouncing rent increases and profiteering and the speed-up and long hours of the munition workers. We concentrated on peace. They concentrated on the class struggle.’ In fact, Scottish activists such as Helen Crawfurd and James Maxton were fighting for both peace and class equality. Glasgow’s Govan district became one of the most important munitions centres in the UK. It was a crucible of anti-war and anti-arms trade agitation for much of the war: true to its sobriquet ‘Red Clydeside.’ A huge protest on the 15th August 1914 uniting the Independent Labour Party, the British Socialist Party, and the Peace Society, made direct links between the struggles for workers’ rights and limiting the profits of the arms traders. In February 1915, thousands of workmen organised by the Clyde Workers’ Committee downed tools, blocking production of armaments. (Many of these skilled engineers were disgruntled at the erosion of craft privileges rather than anti-militarist revolutionaries.) Though often obscured in histories of Clyde workers, women (dubbed ‘munitionettes’) were active, agitating over low wages or unfair dismissal and collaborating with male shop stewards such as David Kirkwood. ‘Issues such as leaving certificates, food queues, and profiteering incensed many workmen to a greater degree than the presence of women in their workshops.’ The ILP newspaper Forward pushed critique beyond shop floor concerns to civil liberties and social justice. The offices were raided for reporting ‘wild scenes’ of munitions workers’ heckling Lloyd George in December 1915, rather than the official propaganda line. Industrial unrest in munitions industries, anti-war and social justice campaigns were deeply entwined, as the activism of Helen Crawfurd (1877-1954) attests. Daughter of a deeply religious Tory master baker, Crawfurd was an unlikely revolutionary. She first rebelled against Church theology, which she felt diminished women. She then earned her stripes in the Women’s Social and Political Union (WSPU) between 1910 and 1914, with four spells of imprisonment and three hunger strikes. Emmeline Pankhurst’s volte-face concerning the Liberal government spurred Crawfurd to join the Independent Labour Party. Her shift from militant suffragette to socialist in 1914 was in part inspired by the plays of Ibsen, Shaw, Galsworthy and Gorky and by her friendship with a radical bookshop proprietor. Out in the streets, infant mortality and sheer deprivation pressed on her conscience. In spite of the loss of both her husband and her mother in 1914, Helen Crawfurd’s energies never dimmed during the war years. Crawfurd, who used to defend Emmeline Pankhurst from chauvinist assailants, rebuked her. ‘Has [Emmeline’s] voice ever been raised since this war started on behalf of the workers of this country against the profiteers and exploiters who have taken advantage of the great crisis to rob and plunder people.’ The profiteering issue created divisions within the suffrage movement nationally, but strengthened bonds between the suffragettes and socialists in Glasgow. (The Glasgow WSPU published ‘Our Suffrage Columns’ in the ILP newspaper Forward). Helen Crawfurd, along with friends Agnes Dollan and Mary Barbour, made connections between the profiteering of arms manufacturers and landlords. Migrations to Glasgow’s burgeoning munitions industry led to acute shortages of (often dilapidated) tenements in Govan, Patrick, Shettleston, Ibrox and Parkhead. In 1915, landlords raised rents and took advantage of laws allowing eviction of tenants in arrears. At a time of soaring living costs, Glasgow brought the issue of fair rents into the national spotlight. Crawfurd, Dollan and Barbour organised tenants defence associations, who pelted bailiffs with flour missiles and refused collectively to pay rent. Workers in factories and shipyards formed emergency committees to support the campaign, and threatened a wave of sympathy strikes in opposition to the imposition of higher rent. Finally, 20,000 people demonstrated, forcing the government to pass the Rent Restriction Act, which froze rents for the duration of the war. Keen to involve women in the fight against the war, Crawfurd and Dollan organised large and regular meetings on Glasgow Green (which brought her into contact with revolutionary John Maclean). In 1915, they founded the Glasgow branch of the Women’s International League for Peace and Freedom, but Crawfurd was vexed by what she saw as WILPF’s bourgeois liberalism and genteel lobbying strategies. In an attempt to lure more working-class women, Crawfurd, Barbour and around 200 women activists organised a peace conference on 10th June 1916. 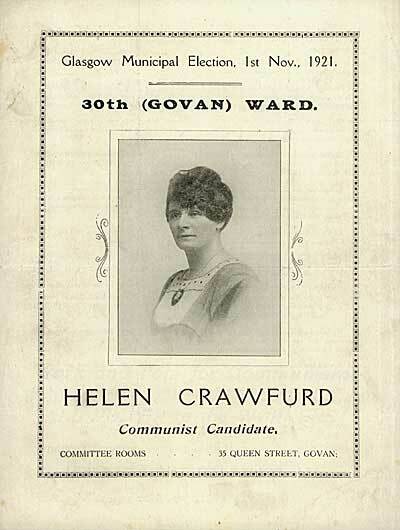 This gave birth to the Glasgow Women’s Peace Crusade, which spread like wildfire across other ILP strongholds and launched as an informal nationwide group in June 1917 with Helen Crawfurd as its Honorary Secretary. On 13th December 1917, women assembled peacefully in George Square. When the Patriot League tried to douse their leaflets and tear their banners, the Women’s Peace Crusade defended themselves by brandishing their umbrellas. In the heat of ‘the Brolly Battle,’ Crawfurd and Dollan sneaked into the City Chambers and showered the City Corporation delegates with leaflets. By the desperate winter of 1918, Crawfurd and Dollan were agitating outside shipyards and scuffling in the Council chamber. The increase in female ILP members is testament to the inclusive measures of the Women’s Peace Crusade leaders, tried and tested during the rent strikes, when Crawfurd, Barbour and Dollan held ‘we are not removing’ meetings in the back court of tenements so women could hear them from their windows while doing their chores. Similar strategies helped mobilise working class women into the Peace Crusade, with ‘women-only’ gatherings at 3pm and street corner meetings for convenience. By the end of the First World War, Crawfurd was a national political figure within the ILP. But, by 1920 she had taken a sharp left turn away from reformist socialism and joined the fledgling Communist Party of Great Britain. James Maxton was best man to the parents of Arming All Sides researcher Frank Jackson. Here is a sonnet Maxton composed for Frank’s father, Fred Jackson. ‘My dearest Sis, … I’m growing a beard. It doesn’t make me look like Ecce Homo, more like Mephisto. I don’t know how long I’m going to be here – I suppose I deserve about 20 years for talking about ‘Peace on Earth and Goodwill among men’. There were indeed police in the audience, and on 29th March Maxton was arrested and charged with attempting ‘to impede, delay and restrict the production of munitions or war material, contrary to the Defence of the Realm Consolidation Act 1914.’ He was refused bail and committed for trial in the High Court of Justiciary at Edinburgh on 11th May, together with James MacDougall. Maxton had originally pleaded not guilty, and it had been expected that he would make a great speech attacking capitalism and its product, war. In the event, the accused pleaded guilty. Apart from the prospect of shorter sentences, it is not clear what motivated this reversal. Their defence lawyer, Rosslyn Mitchell, pleaded for leniency: ‘these men are men of unimpeachable character… They are both prepared, should the court think it sufficient, to be bound over to refrain from taking part in any political activity during the period of the war.’ They were sentenced to one year’s imprisonment, to run from the date of their arrest. By contrast, Maxton’s revolutionary friend John Maclean, who had earlier been charged with sedition, remained defiant to the end and received a three-year sentence. When they were released on 3rd February 1917, Maxton and other ex-prisoners had a period of convalescence at the Moffat Hydropathic, where they enjoyed Turkish baths and other luxuries never before experienced. The Military Service Tribunal granted him an exemption from active service as long as he undertook work at home of national importance. He refused to do any work to aid the war effort, and became unemployed for a time. In July 1917 he obtained work in a shipyard that was not engaged in war work, and did a number of manual jobs. He was thus able to participate in the manual workers’ struggles as one of themselves. In January 1918, the desperate government raised the age of conscription to 50, via the Manpower Bill, dubbed the Manslaughter Bill by Maxton. A government Minister, Sir Auckland Geddes, was sent to Clydeside to persuade the workers to support the Bill. A mass meeting on 28th January, after first shouting Geddes down and then giving him a hearing, resolved that Clydeside would do nothing to support continuation of war and do everything to end it.’ Maxton had seconded the motion. The shop stewards’ committee had envisaged a national strike against the war, but that was still a step too far. They recognised this and concentrated on preparing for peace. One month after the group got started, Glasgow Campaign Against Arms Trade had already made the headlines: the Herald featured a member’s thoughtful piece on Scotland’s role in the international arms trade. In the same week, The Independent picked up on the group’s challenge to arms company sponsorship of the Commonwealth Games in Glasgow. Glasgow today lives up to its radical past – a street poll asked people what they would buy with the £2.5 billion recently allocated to new fighter jets. This is how Glasgow voted: 33 votes for nurses, 28 for public homes, 16 for teachers, only 1 for fighter jets. Just down the road in Faslane is where Trident, the UK’s nuclear weapons system, is based. Opposition to its presence in Scotland is huge: the Scottish Government’s pledge to scrap Trident if the country went independent shows what a popular issue this is.